4 Beds 3 / 0 Baths 2,120 Sq. ft. Description: Spacious trussville home with full brick construction, poured concrete foundation, large corner lot, spacious back patio and deck, privacy fenced yard, and more. The main level boasts hardwood floors, gas fireplace, and separate dining room. You’ll find stainless appliances in the kitchen, stone countertops, pantry, laundry room, island with breakfast bar, and eat-in area. The master suite provides a jetted tub, separate water closet, separate shower, huge closet, and double vanities. Additional features: finished basement with big den, 4th bedroom, jack-n-jill bathroom, an office that could easily be converted to a 5th bedroom, 2 car garage with lots of extra space for storage or workshop, and terraced area in yard for play set or garden. 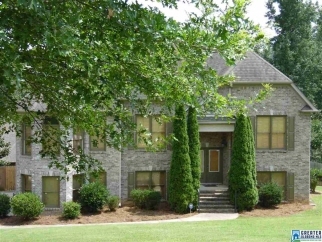 This is a very convenient location to i459, i20, i59, shopping, and dining and is zoned for trussville schools. Great price for the size of this home. Call to schedule your appointment today!